We launched Call for Code in May with a bold vision: To show the world that developers have the power to save lives in times of natural disaster. We had hoped the response from developers would be positive — we had no idea it would be this incredible — and that so many global leaders would champion the cause. 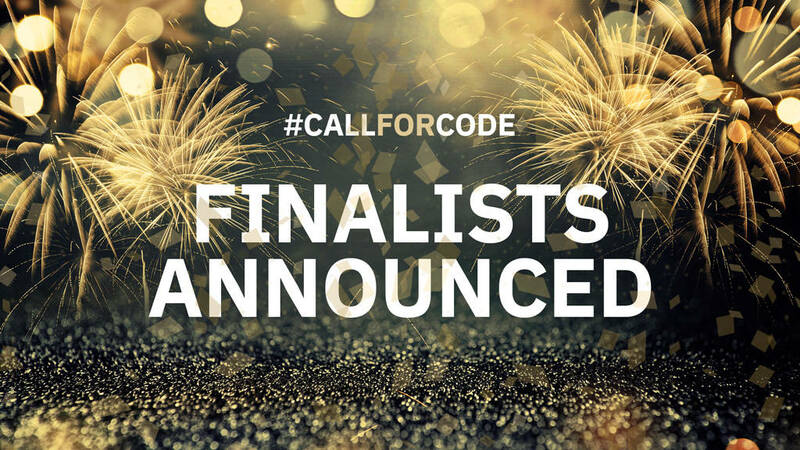 Today, we’re thrilled to announce the 2018 Call for Code challenge finalists and add one more name to the list of eminent supporters. We are so honored that President Bill Clinton has joined our esteemed panel of judges. In addition to dealing with natural disasters and their aftermath as a two-term American President, earlier this year, President Clinton launched the Clinton Global Initiative Action Network on Post-Disaster Recovery, which makes his expertise even more valuable in vetting the top Call for Code submissions. What an incredible journey Call for Code has been. Since May, we’ve held more than 300 events in more than 50 cities around the world, where I’ve had the privilege of meeting and talking to so many developers who have been so ready and willing to give their time, talent, and creativity to build software that can save lives. Those of us who work in this industry have always known the great power that developers wield. Now, it’s time to showcase this power on a global stage. All told, more than 100,000 developers from 156 nations answered the call, creating more than 2,500 apps to help with disaster preparedness and relief. We’ve been floored by the innovation we’ve seen from these solutions. On October 29, we will be in San Francisco celebrating one of the largest developer engagements in history and announcing the winners. I hope you can join us either in person or via livestream. The problem: Following a natural disaster, the work to assess damage and facilitate community recovery begins. Sending engineers to survey houses is costly, time consuming and resources are spread thin. Natural disasters displace millions of people every year, often leaving many temporarily homeless. Proposed solution: What if artificial intelligence could automate checks that get displaced residents back into their homes sooner? Seeing the damage caused by the 2015 Nepal earthquake, team PD3R from Kathmandu created a solution to provide displaced families with immediate access to engineering advice following a natural disaster with a solution based on AI taught by 3D model images. How they built it: PD3R built a custom Visual Recognition model based on more than 2,000 images with Watson Studio. The team uses IBM Watson APIs to assess structural damage on buildings and determine if houses can be retrofitted, rather than rebuilt completely, allowing disaster victims to return home sooner. Potential impact: This solution could accelerate the deployment of construction teams to more than 100,000 displaced residents still awaiting support after the 2015 Nepal earthquake, with a goal of helping them return home sooner. Next steps: The team hopes to scale this concept worldwide, resulting in a rapidly deployable country-specific system that is capable of going live immediately after a disaster. Greenville, NC, United States. New York, NY, United States. The problem: Disaster preparation and recovery is a complex, high pressure, and costly endeavor. To avoid the chaos and uncertainty a disaster can bring, first responders need to make critical decisions with limited evidence and execute with confidence. Proposed solution: Project Owl is a software/hardware combination that provides an offline communication infrastructure that gives first responders a simple experience for managing all aspects of a disaster. It taps into data from a growing list of APIs and open data sets, including the Weather Company, the American Red Cross, and FEMA. Civilians on the mobile ad-hoc “Clusterduck” network – an offline communications infrastructure created by physical, Wi-Fi-enabled devices dispersed in clusters – can also send information about their situation, location, and needs. Owl’s incident management capabilities are accessed through a conversational interface, providing an intuitive experience for the tired and stressed first responders. How they built it: Project Owl bakes in the latest IBM Watson Studio, Watson Cloud APIs and Weather Company APIs – all built on the IBM Cloud – to provide an effective solution for preparation, management, and recovery from a disaster through an intuitive conversational experience. Potential impact: Project Owl has the potential to save time, money, and lives in the aftermath of natural disasters when networks are down and every second counts in responding to those in need. Next steps: The team will focus their solution in areas where annual weather patterns consistently impact communities negatively, such as India, China, and the Philippines as well as the United States. Mexico City, Mexico. Montreal, Canada. London, England. The problem: When floods or earthquakes strike, cell networks tend to fail, halting communication and hindering relief efforts. Proposed solution: The IBM Watson-based IRIS dashboard was created to work with the existing Project Lantern, a portable, wireless device that helps keep people connected in times of need. IRIS aids collaboration between local volunteers, at risk populations and trained relief workers. The project relies on low-cost hardware, social data and real-time data that evolves as it learns and as situations change. How they built it: Under the hood is machine learning, powered by IBM Watson Studio, which tackles the problem of predicting the optimal distribution of supplies in affected areas. The solution pulls in Weather Company API data, and relies on a Cloudant database. IBM Watson AI Assistant powers the chatbot. Potential Impact: The IRIS dashboard displays real-time maps of disaster regions, travel routes and priorities across the long-range network. A chatbot helps find patterns and inform decisions each day about where to deliver supplies and how to serve those populations most in need. The dashboard gets information from dispersed lanterns, keychain-sized devices that serve as a pop-up communication hub for disaster recovery over an offline, wireless network. With customizable web apps to receive news, ask for help and volunteer, as well as a map tool to guide users to shelters, fresh waste and fuel, this solution is designed to keep communities organized in pivotal moments of need. Next steps: The team is building a user experience that requires no formal training and can help organize a bottom-up (or top down) recovery effort. They are also working with trained experts in disaster response (one is even a team member) to ensure their solutions are at once pragmatic and reliable. The problem: During an emergency, cash and credit cards can be lost and relatives can be separated, which leaves disaster victims without the money they may need. Proposed solution: United Aid Net (UAN) aims to solve this problem with a global emergency assistance network for uninterrupted financial services during and after natural disasters. Based on facial recognition withdrawal and blockchain technology, United Aid Net allows temporary shared financial services among family members or friends during disasters. How they built it: For UAN, Green Coder implements IBM Blockchain Platform, IBM Cloudant Service, IBM Cloud Liberty for Java, IBM Cloud Db2, along with IBM Watson Visual Recognition for the facial recognition piece. Potential impact: Beneficiaries of customers can use facial recognition to withdraw a small amount of cash through UAN alliances’ ATMs. The inter-bank transaction bills for emergency withdrawals will be cleared and maintained through the UAN Hyperledger-based blockchain network. For beneficiaries, UAN can increase efficiency, improves user experience and reduces turnaround time on financial requests from several days to two minutes. For banks, it has the potential to reduce operation cost and enhance enterprise image. For society, it contributes to public welfare, social stability, and embodies international humanitarianism. Next steps: In recent years, Agricultural Bank of China (ABC) and many other banks in China started to adopt facial recognition technology. At present, 12,000 ABC’s ATMs enabled facial recognition to withdraw cash, and the daily transaction volume has reached 25,000. However, this still doesn’t allow people to withdraw cash from their relative’s accounts. To address this issue, ABC has developed UAN and would like to roll it out. The problem: Extreme weather leads to a greater incidence of wildfires, which creates often unprecedented challenges for developing nations. The solution: Lali Wildfire Detection gives these developing nations, which are often the most vulnerable to the impact of natural disasters, a simple and inexpensive way to prevent wildfires. How they built it: Lali Wildfire Detection is built on the IBM Cloud, and uses IoT Platform, serverless, analytics, data services with Sigfox technology to deploy temperature sensors in a forest, creating a temperature sensor grid that provides real-time data for firefighters. Potential impact: By creating a temperature sensor grid, this solution provides real-time ground data for firefighters that can be more accurate and provide better response time than satellite information. The data pipeline from the low-cost sensors feeds into IBM IoT, providing live updates to Node-RED-powered maps to visualize all sensor locations with the relevant data. These temperature maps can help measure the pattern a fire will follow, allowing response teams to create a more effective containment plan. Next steps: Sigfox connectivity will spark the possibility of implementing other solutions, such as communication pagers for firefighters, animal tags, rain measurement systems and more. Each of these teams will receive long-term open source project support from The Linux Foundation. They will compete for the USD$200,000 grand prize and the opportunity to deploy the solution through the IBM Corporate Service Corps. The winner will also be introduced to a venture capitalist firm and have the chance to pitch his or her idea into a funded company. In addition to President Clinton, the eminent judges include Jim Zemlin, Executive Director, The Linux Foundation; Kate Gilmore, United Nations Deputy High Commissioner for Human Rights; Dr. Irwin Redlener, Director of National Center for Disaster Preparedness at the Earth Institute of Columbia University; Deborah Dugan, Chief Executive Officer, (RED); and Grace Kim, Design and Research Lead at Twitter. The Call for Code has received tremendous support from partners, such as United Nations Human Rights and The American Red Cross, and an ecosystem of organizations including the NEA, The Linux Foundation, Cloud Native Computing Foundation and dozens more. You don’t want to miss the Call for Code Global Prize Celebration on October 29, which features special musical guest, Local Natives. If you’re in the San Francisco area, request a ticket. Or join us via the livestream on your preferred platform, including the IBM Developer Twitter, YouTube, Twitch and Facebook channels.